In the first part of this entry I’ve asked the Blake Cottage Trust some questions that they have a public duty to respond to, as they concern their unethical practice and mismanagement in their handling of Blake’s cottage. I also commented on their bizarre display of virtual images of a future cottage that stand in painful contrast with the dire actual conditions in which the building stands now. I also said that I’d comment on a document they have recently published in their website. I’d advise the reader to take a look at the first part of this entry as well (A virtual visitor centre… Part I). The mentioned document is 33 pages long, it is illustrated with the same virtual-reality images that we saw in the video recently published by the Bognor Regis Observer, and it purportedly contains the architectural plans for Blake’s cottage. It contains, however, more than that: it contains baffling contradictions and statements that confirm what some of us have known for a long time: that there is no real project or vision for the use of the cottage, and that the Blake Cottage Trust has never intended to honour the original project that donors and the public supported in such good faith. The Blake Cottage Trust is still bent on turning it instead into some kind of literary hotel. But let us start with the minor issues, and the odd. It called my attention, for instance, that Mr Tim Heath, the BCT’s Chair, keeps on stealing some of my words and ideas to try to articulate what the cottage might be. I’ve mentioned this before. It’s not even outrageous anymore – it is just boring, and pathetic. We should keep an eye on this. After all the instances of extraordinarily dodgy practice we have seen so far, it would be important to know who they intend to offer accommodation to in the cottage’s grounds. Would William and Catherine Blake have recognised a visitor centre in their garden? This question is important because the original plan for Blake’s Cottage was to make of it a creative residence for authors, artists and thinkers that would give continuity to Blake’s dissenting imagination, and we were adamant about preserving the building’s peace, which would be conducive to creating, without the distractions of a visitor centre. The visitor centre, as anyone who has followed the wretched story of the Blake’s Cottage project knows, would be created in nearby Bognor; it would function in close collaboration with the building in Felpham, and it was an idea and contribution to the project brought by the Big Blake Project – who, as we also know, were elbowed out by Mr Heath as soon as the cottage was purchased -, while he stole this idea from them. Those props – put in place a long time after its purchase – are, as we know, the only thing that the BCT has done for the actual building in 30 months. They publish a couple of the many existing pictures of the awful condition of the building, manipulating them along with their text so it would seem as if they promptly set those props in place to avoid further damage. However, that is far from being the truth. In the long history of the cottage and its structural changes that they take us through in these pages – no doubt interesting – they fail to mention one important point: that when the Cottage Appeal started in 2014, though we knew that the thatched roof had damage, it wasn’t all that apparent. I know this, because I visited the building myself that year. The dismal state of disrepair and neglect that has been revealed by photographs taken this year simply wasn’t there. That is to say, that the further disrepair and neglect have all taken place during the years that the Blake Cottage Trust has been in possession of the building. This means that from 2015 to October 2016 they did absolutely nothing to avoid further disrepair, and that from 2016 to this day they have done nothing more. The Cottage Appeal started in 2014. That may be, for some, many years ago. The excess of information we’re all exposed to inevitably means that we forget much. However, I am sure that neither donors nor all those who supported our project then have forgotten that the project was one of a creative haven for artists that would also include as part of its programme a house of refuge for persecuted writers. Of course the doors would be open to the public as well; there would be exhibitions, talks, etc., and this cultural programme would be closely linked to what artists and writers created within the cottage’s walls. If the reader has forgotten, or is curious to know, the whole story of the project has been told, step by step, in the My Testimony section in this webpage: My Testimony. In my testimony you will learn, with the aid of the provided evidence, that from the moment the cottage was acquired I have been very worried by Mr Heath’s repeated allusions to Blake’s Cottage becoming a kind of hotel according to his fancy. The Blake Cottage Trust has changed over and over again the information they give to the public about their actual plans for the building, as I have also summarized in another blog entry (https://blakecottage.com/2016/12/16/the-project-for-blakes-cottage/). They have contradicted themselves endless times; they have amended their statements depending on the concerns publicly raised by myself or other campaigners, and in the midst of this inconsistency, there has been only one constant: the Chair’s goal of opening the doors of the cottage so that people, in his own words, “can sleep in Blake’s bed”. And this is certainly not what those of us who were involved in the campaign worked so hard for, let alone what the donors and the public supported with such generosity. In 2016 an article in The Sunday Times mentioned my concerns about the Blake Cottage Trust’s disowning of the original project and the Chair’s intentions of turning the building into a kind of Blakean B&B. Mr Heath denied that he had any such intention (article The Sunday Times). According to whom the best way to stop a literary house from becoming a lifeless museum is to turn it into a small hotel? Why is he changing his discourse again? He had said this before and I challenged him in this blog, reminding him that the project that the public supported was one of a real creative residency, and that no meaningful creative work could be achieved in a week, let alone a weekend. He therefore modified his story and begrudgingly mentioned longer creative residencies. Are we to understand by his latest statements that he’s gone back to his plans of simply having people holidaying in the cottage? With which criteria are those artists or researchers going to be invited to holiday in the cottage, and what for? Where is the concrete, professional project of what they have in mind when they vaguely talk about cultural activities in the visitor centre, and where is the board of trusted and accountable individuals and institutions that will oversee that? That’s it: letting out rooms is the main purpose of the Blake Cottage Trust. They have passed the small exhibitions, concerts and talks that we would hold there in the original project (intimate given the dimensions of the building) to their sleek visitor centre, because the cottage itself will be no more than a hotel. How can the Blake Cottage Trust justify spending millions of pounds in creating a flashy state-of-the-art empty visitor centre with the sole aim of having their own private hotel? The idea was to preserve Blake’s Cottage. How did it become the turning of Blake’s Cottage into a hotel as a front for an empty expensive building for which there is no concrete plan or vision, and of the said empty expensive building into a front for their hotel? How can they possibly have taken seriously the whimsical mantra of their Chair of letting people “sleep in Blake’s bed”, or, as he says in their webpage’s FAQ section, “So, yes, every home should be a gallery, and every room a place of creation and procreation – Blake’s Cottage especially so”? It can’t be clearer now. All the ideals, the hard work, the principles; all the beauty of the original project; all the support given by individuals and institutions; all the generosity, so many hopes to make of the cottage a place that would honour William Blake by supporting artistic and intellectual creation, have been trampled on by three men representing an illegitimate trust set up by one of them in secret, hiding from his co-campaigners and from the Blake Society, which was responsible for the appeal, in order to let out rooms and fulfill Mr Heath’s fantasies of having people sleep in Blake’s bed. It is an unwholesome fantasy, bred by betrayal of colleagues and of public trust, misuse of funding and, needless to say, a sorrowful betrayal of everything that William Blake stood for. What right do these three men think they have to do this? Are we, who care for Blake’s legacy, going to allow them to do it? We live in times when it’s easy to lose our grip on reality and start living entirely in a fantasy world. Our overdose on what we call technological advances has made of the disconnection, dissociation and disintegration of our minds a strange commodity. In this context, I wonder whether if the Blake Cottage Trust’s three Trustees have really lost it altogether now, whether if they are trying to take advantage of the gullibility of contemporary men- and women-folk, ever more willing to believe in what is not actually there, or a combination of both. Be as it may, we recently had a chance to see an article on the Bognor Regis Observer, boasting 3D images of Blake’s Cottage (new Blake’s Cottage 3D images). The reader could access this piece of entertainment by watching the accompanying video: a slide show created by MICA, the architecture firm that the BCT has chosen to help them do as they wish. The video has an interesting caption telling us that we’re looking at images “of what a fully restored Blake’s Cottage would look like”. That is, we’re watching images belonging to the realm of make-believe. Those deadened images of something that has no material existence are, of course, ultra-modern architectural sketches for a project, and nothing more. They don’t show much of the purported restoration of the actual cottage (apart from showing a whitewashed exterior rather than the present brick and flint-stone one). They rather concentrate on the polemic visitor centre on its grounds, which was never part of the original plan, and which has met with no little objection. With what money has the Blake Cottage Trust been paying MICA architects to draw up their plans? I ask this because the production of such sleek (even if, in the circumstances, meaningless) images cost money, and while the Blake Cottage Trust keeps on trying to fool the public with ever clumsier attempts to draw them into their fantasy world, the reality of Blake Cottage is one of dismal decay. The state of its physical existence is as far from restoration as it can possibly be, as visitors could see by themselves during the recent open days, orchestrated around the Blake Petworth exhibition. Mrs Beryl Kingston documented the sad reality in her blog. The images make one want to cry, be extremely worried, and angry. You can look at Mrs Kingston’s blog here: If Blake’s cottage had a voice it would cry help . Why hasn’t the money used to pay the architects to plan a fancy, controversial visitor centre been applied instead for the obviously urgent: to actually restore the building and preventing it from collapsing altogether? Why has the Blake Cottage Trust allowed Blake’s cottage to reach such a dire state of disrepair during the 2 years and a half since it was acquired? There are further questions regarding those images of disrepair, one of which the Blake Cottage Trust is using to keep on lying to the public in a curious little document they have just published, but the said document is interesting enough to merit its own entry, so I’ll leave the matter for the second part of this comment. Why are they looking for additional trustees only now? Why have the three of them been grasping at the illegitimate trust they formed for two years and a half, ignoring completely those of us who’ve repeateadly reminded them that when we started the Cottage Appeal we aimed at creating a large, proper and inclusive trust that would be transparent and accountable, and that it was completely inappropriate, unethical and verging on fraudulent practice for them to appropriate a public project? And why do they suddenly want local trustees, again, two years and a half after they acquired the Cottage and bullied out the Big Blake Project – the Felpham organism with which we at the Blake Society ran the campaign -, actually calling them “a pressure group”? And why, after having treated the Felpham community with great contempt during all this time? I will remind these men that it is a bit too late now to be boasting about being looking for more trustees, local or otherwise. What they have been engaged in since Blake’s cottage was acquired on September 2015 is too long a chain of unethical practice, incompetence and blatant, constant lying to the public, and therefore the only way for a Blake Cottage Trust to function is to open it up completely as we had originally conceived it, calling for the accountable and trust-worthy institutions and individuals who can take proper care of the property. What this means is that none of these three men can possibly remain in a legitimate Blake Cottage Trust, because none of them has been accountable for their actions, nor trust-worthy or ethical for the past two years and a half. Their time to “disappear”, as Mr Johns said, has long been up. If the architectural stage has taken nearly nine months, what exactly has the Blake Cottage Trust been doing for the other 21 months during which the cottage has been in their hands? I can say what they have not been doing: they have not been building a reliable and accountable trust, despite having been repeatedly asked to do so and to honour what those of us who worked in the Cottage Appeal promised to donors and the public to do, and this means that therefore the cottage hasn’t benefited from the expertise of people and institutions in the various aspects of the project, working as a team, that was crucial for its success. It also means that there was no swift, visible and energetic continuation of the fundraising immediately after the purchase of the cottage, which was also crucial. Instead of that, they remained for nearly a year in complete silence, not deigning to make public a single word about their plans for the building. When they finally spoke, it was to start weaving a fantastic web of lies, bullying and intimidation. The document I mentioned above that the Blake Cottage Trust has just published in their website is the latest example of those extensive lying, contradictions and manipulation, and these are so outrageous that, as I said, the second part of this blog entry will be dedicated exclusively to it. Please keep an eye on this space. Meanwhile, I’d just like to remind the reader that Mr Peter Johns, the Treasurer of the Blake Cottage Trust, has presented in the past an inaccurate Blake Cottage Trust’s Report and Financial Statement in which he’s plainly lying, as stated in former entries in this blog (Inconsistencies in Blake Cottage Trust and Blake Society financial reports), and that is very serious indeed. Today the Blake Society and the Blake Cottage Trust have announced that tomorrow they will host a meeting with the chosen architects to carry out their plans for Blake’s Cottage. Mr Stuart Cade and James Roach, from Rick Mather Architects, will be talking with the public. I have informed them about the problems surrounding the Cottage, in case they didn’t know, including the fact that the demolition of the annexe and the building of a visitor centre on the Cottage’s grounds were never part of the project and that there is strong opposition to these plans. The matter is explained in detail in my testimony in this webpage, particularly chapters IV and XVIII. We hope that Mr Cade and Mr Roach will have the sensibility to understand what is at stake in this project, and be wary about the unscrupulous organisation they are engaging with. A couple of days ago we’ve had another reason for concern: the Blake Society is announcing a grand event next 25 September to raise funds to mark Blake’s grave in Bunhill Fields: a Wake for Blake. It is distressing to see that the BS is still using and abusing the trust and the good name of other people, eliciting their support, and their money, when they still have not become accountable to donors and the public about the fraudulent practice through which they allowed Mr Heath, their Chair, to acquire Blake’s Cottage for himself and create his own little private Trust. That they are trying to get more money from the public while the Blake Society’s and Blake Cottage Trust’s muddled financial reports, that bear little respect for truth, are still being investigated by the relevant authorities (the Charity Commission, on two occasions with a reminder from Action Fraud) is very worrying indeed. To add to our concerns, news about this event was sent to the Blake Society’s members and friends by Mr Nick Duncan, signing as Trustee. Mr Duncan was a Trustee when I was also in the Blake Society Committee, if I remember well before I became its Secretary. He left and I didn’t hear back from him until 2016, in unusual circumstances. However, on May 2016 we exchanged correspondence. He said he was “sad” that I was making public the corruption around the Cottage and informed me that he was again a Trustee: that he had just been co-opted. Soon after that I found out that just one month earlier Mr Duncan had been the “independent examiner” of the Blake Society.’s finances As I have previously stated in this webpage, the BS’ financial report is inaccurate, lacks transparency and regard to truth, a situation echoed by the Blake Cottage Trust’s financial report. I made the matter public in this webpage, saying that a Trustee of a Charity cannot be at the same time the supposedly independent examiner of their finances, and I contacted the Charity Commission. I also asked why the Blake Society lied in their webpage for over a year stating that Dr Duncan had been elected as a Trustee at the AGM in 2016, when that was certainly not the case, as both their minutes and his own correspondence with me prove. Soon after the AGM the Blake Society published their minutes. They were, again, riddled with lies. I said so in this blog and they quietly made them disappear, and as of today, 2 June 2017, they haven’t published them again. It would be interesting to see what they say in regards of the elected Trustees. In short: the Blake Cottage Trust and Blake Society have been lying in their financial reports regarding Blake’s Cottage; the Blake Society’s lack of transparency involves having one of its own Trustees, Mr. Nick Duncan, as an “Independent examiner”. Because the Charity Commission was investigating this issue, I had made it public and they knew I would attend the 2017 AGM, they secreted Mr Duncan away at the AGM, then very quietly scurried him back afterwards, by co-opting him again, I suppose. This means not only that there is nothing independent or transparent about the Blake Society’s handling of finances regarding Blake’s Cottage, but that they are intent on making a mockery of their duty to be publicly accountable and deal seriously with concerns raised about them. As stated earlier in this blog, theirs and the BCT’s messy finances haven’t been put right, and none of either organisations has become accountable to the public with a truthful report regarding the money raised. And still, the Blake Society, with Mr Duncan himself as spokesperson, are now calling for more money for another project and for famous people to lend them a veneer of respectability. The Grave Project itself has been far from an edifying matter in the history of the Blake Society and members surely remember how long it has taken to materialize. The first funds were actually raised several years ago by a then fellow Trustee, Simeon Gallu, and myself, after which the project was again abandoned, to the exasperation of the Treasurer Mr Luis Garrido and his wife Carol Garrido, then also a Trustee, who carried out the investigation to locate the exact place where Blake is buried in Bunhill Fields. Mr Garrido knows fully well that everything that happened with Blake’s Cottage is unethical and frankly disgraceful. He has told me so himself several times. He put up with much indignity though, because after the Cottage appeal he was promised that now the Society would finally raise funds for his project of marking the grave. Several chapters in my testimony show evidence of the degree to which Mr Garrido is aware of the lack of scruples and integrity rife in the Blake Society and the Blake Cottage project, and how he has borne it all for the sake of a grave. The indignities include joining in the slandering of me that the Blake Society has been incurring in, with a worrying degree of sexism involved. Beautiful as the project of marking the actual place where Blake is buried once was, it cannot hold any beauty now that funds for it are being raised by the same unscrupulous people who stole a project and the money given by over 700 generous donors in order to give Blake’s Cottage to Mr Tim Heath and his illegitimate Trust. They are using the same cunning methods. In this context, their upcoming gala means nothing but spitting on Blake’s grave. I have finally posted the last chapter of my testimony about what happened with Blake’s Cottage. I am grateful to those who have had the patience to read so far. I am also grateful to the process itself: it has been immensely liberating. Throughout the writing of this testimony I have been able to engage joyfully again with William Blake’s work, without feeling anymore the pain and even sense of threat that the sole mention of his name used to trigger after this ordeal. One day, after working on a chapter, I went to Bunhill Fields – a place I thought I’d never be able to visit again – and just sat there on a bench close to the familiar inscribed stone and fig tree. I recognized all the trees that I had come to love after many visits, and enjoyed again the quiet, the shade: peace. It was a most happy day. Telling the truth performs this kind of humble miracles. I do hope that this testimony will do its bit, in time, towards a visible restoration of truth around Blake’s Cottage. 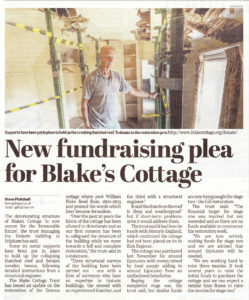 I do hope too that the Cottage will be saved from ruin, that its grounds will be saved from the aggression of the “multi-purpose building” that the Blake Cottage Trust is planning to impose, and that this small and much loved building will have its dignity restored. I also demand pristine financial reports, backed by the relevant documents, from the Blake Cottage Trust and the Blake Society regarding Blake’s Cottage, and I remind the Trustees of both organisations that slandering is a serious offence. The sexism involved in their slandering of me would also, I think, have been offensive to such a libertarian as William Blake.